Dunbar and Boardman: Who built Britain’s first electric lift? Modern day entrepreneurs and inventors understandably command a lot of attention in business circles but less focus is placed on their successful predecessors. The vertical transportation industry is littered with the achievements of nineteenth century industrialists and inventors. The story of Britain’s first electric lift begins in 1833 with a man called Robert Waygood. It was in that year that he founded R Waygood and Co in Beaminster, Dorset. In 1840 the company moved to Falmouth Road, Great Dover Street, London. Their stated area of business was the manufacture of lifts and cranes. Their lifts were initially hand operated and then water powered hydraulic lifts were added. What were the achievements of Waygood and Co? Waygood and Co produced hydraulic lifts from 1868 in conjunction with the London Hydraulic Power Company after their first installation of a hydraulic lift in the same year. They were not the first to install a hydraulic lift. In 1845 the industrialist, William George Armstrong invented a hydraulic crane that paved the way for hydraulic lifts. 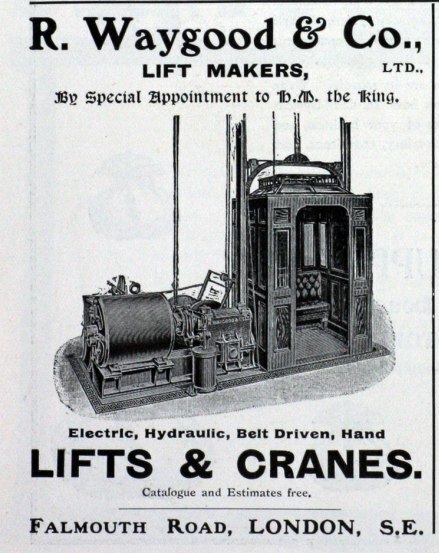 The first hydraulic lift was installed in 1846. The practicality of the hydraulic lift was internationally recognized when Leon Edoux exhibited one at the Paris Exposition in 1867. Waygood’s first installation was in 1868. In 1875 Robert Waygood sold his company to J.M Day, Henry Walker and W. R Green and took retirement. It was at this point that the company placed a greater focus on lifts. Between the 1875 and the 1890s Waygood & Co. completed many installations and became nationally recognised in the United Kingdom. Waygood & Co became the foremost lift manufacturer in the United Kingdom. Their notable achievements include the introduction of a direct acting lift that returned water to an accumulator in 1884 and the construction of a water balance lift on the cliff at Folkestone, Kent known as The Leas Lift in 1885. However, their greatest achievement was probably the introduction of Britain’s first electric lift at the Crystal Palace Exhibition of 1890. The world’s first electric lift had built by Werner von Siemens in 1880 as part of the Mannheim Pfalzgau Trade & Agricultural Exhibition in Germany. Despite lots of interest from hotels at the time Werner Von Siemens did not then focus on converting his electric lift into a practical form of vertical transportation. The first person to use a DC motor for an elevator is believed to have been Wegster in 1884. In 1889 Norton Otis, son of the pioneering Elisha, developed an electric elevator. It was the first direct-connected geared elevator in the world and was installed in the Demarest Carriage Building on Fifth Avenue in New York. Waygood & Co’s electric lift built for the Crystal Palace Exhibition was the first in Britain. Hydraulic lifts were still preferred over electric until two significant developments took place. First of all, in 1900 the alternating current induction motor was introduced. Then in 1903 Otis introduced the gearless traction electric elevator that enabled lift cars to transport passengers up high rise buildings with dozens of floors. Otis were not only innovating they were also expanding operations internationally and in 1913 Otis acquired Waygood & Co. By 1913 Waygood & Co was an officially recognised subsidiary of Otis. Up to the 1950's the combined company traded as Waygood Otis but then the Waygood name seems to have disappeared. Dunbar and Boardman is the lift, escalator and access equipment consultancy. Do you have a current or planned project that includes vertical transportation? We would be happy to discuss any such requirements and how we may be able to assist. Give us a call on T +44 (0) 20 7739 5093 or send us an email via peterboardman@dunbarboardman.com to start the conversation. We look forward to hearing from you. Your blog improves my knowledge about tallest buildings in the world. Dr Andrew Unterweger is a specialist person in this field. If you have any problem, you can contact with him. Good informative post. i really love this article. Thank you for your sharing. I like your blog. I am really enjoying your blog. Thanks for sharing your experience.